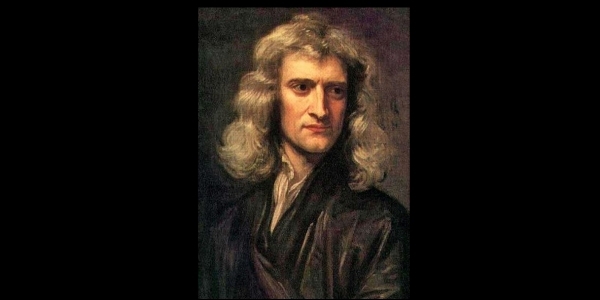 A contemporary of Robert Boyle, Sir Isaac Newton became a mathematician and a natural philosopher, discovering the laws of universal gravitation and formulating the three laws of motion, which aided in advancement of the discipline of dynamics. Newton was a discoverer of calculus and helped develop it into a comprehensive branch of mathematics. During the Plague of 1665-66, Newton moved to Woolsthorp, Lincolnshire. He was honored to occupy the Lucasian Chair of Mathematics, 1669, and was elected Fellow of the Royal Society, 1672. Newton was given the position of Master of the Mint, 1699, and in 1701, entered Parliament. He constructed one of the first practical reflecting telescope. Using a prism, Newton demonstrated that a beam of light contained all the colors of the rainbow. He laid the foundation for the great law of energy conservation and developed the particle theory of light propagation. In 1703, Sir Issac Newton became the president of the Royal Society, and served in that position until his death. In his book “Chronology,” Newton studied the sequence of historical events and inserted a geometric diagram of Solomon’s Temple, giving the lengths of the Temple in relation to the measurement of time. This was in accordance with the Renaissance view that the Temple was a microcosm of God’s creation embodying the order of the universe. Newton wrote in a “Short Scheme of the True Religion” (Sir David Brewster, “Memoirs of the Life, Writings, and Discoveries of Sir Isaac Newton,” Edinburgh, Thomas Constable and Co., 1855, Vol. II, p. 347-348): “Opposite to godliness is atheism in profession, and idolatry in practice. Atheism is so senseless and odious to mankind, that it never had many professors. Can it be by accident that all birds, beasts, and men have their right side and left side alike shaped, (except in their bowels); and just two eyes, and no more, on either side of the face; and just two ears on either side of the head; and a nose with two holes; and either two forelegs, or two wings, or two arms on the shoulders, and two legs on the hips, and no more? Whence arises this uniformity in all their outward shapes but from the counsel and contrivance of an Author? Whence is it that the eyes of all sorts of living creatures are transparent to the very bottom, and the only transparent members in the body, having on the outside a hard transparent skin, and within transparent humours, with a crystalline lens in the middle, and a pupil before the lens, all of them so finely shaped and fitted for vision, that no artist can mend them? Did blind chance know that there was light, and what was its refraction, and fit the eyes of all creatures, after the most curious manner, to make use of it? Sir Isaac Newton died March 20, 1727.